Triki A1. OMRI MED A1. GUICHA M2. BEN HASSEN M2. AROUS M1. FAKHFAKH Z1. Adhesion of non-woven Alfa fibres in unsaturated polyester matrix has been studied by means of a dielectric spectrometer and Scanning Electron Microscope (SEM) observations. Non-woven Alfa fibres were obtained either by a reinforcement sheet of Alfa and wool fibres in a relative volume fraction 4:1 or by a reinforcement sheet of Alfa, wool and thermo-binder (Pe/Pet) fibres in a relative volume fraction 17:2:1. Two composites with the Alfa/wool reinforcement have been studied to evidence the effect of the needle punching passages on the fibres/matrix adhesion. Whereas two other composites with the Alfa/wool/thermo-binder reinforcement have been studied to evidence the effect of the Shirley analyzer passages on the fibres/matrix adhesion. These two parameters affect the hydrophilic character of Alfa fibres. Nevertheless, their adhesion in the matrix is also related to the hybrid character of the composite..
SAHI S1. DJIDJELLI H1. BOUKERROU A1. 1LABORATOIRE DES MATERIAUX POLYMERES AVANCES (LMPA), DEPARTEMENT DE GENIE DES PROCEDES, UNIVERSITE ABDRAHMANE MIRA DE BEJAIA, ROUTE DE TARGA-OUZEMMOUR, BEJAIA 06000 ALGERIA. In order to obtain a cost-effective partially biodegradable plastic, corn flour (CF) has been used as a reinforcing phase in commodity thermoplastic matrix (low density polyethylene- LDPE). But CF and LDPE blend are incompatible due to the strong polarity of filler and the low polarity of the matrix. This problem may be reduced by the pretreatment of corn flour, which can enhance compatibility. In this study, CF was treated with NaOH and anhydride acetic (AAc). The effect of pretreatment on the hydroxyl groups of the corn flour was examined by Fourier Transform infrared. LDPE-treated corn flour composites at ratio of 70:30 (wt.%) were prepared and the microstructure, the thermal, tensile and the water absorption properties of resulting composites were evaluated and compared. The highest properties (tensile strength and water absorption) were obtained for the LDPE/alkali treated corn flour composites..
BOUATAY F1. BOUSSAID S2. DRIRA N1. MHENNI M. F1. The aim of this paper was to develop a new process for valorization of CO2 gas into neutralization of an effluent taken from textile finishing and dyeing unit. The effect of the main operating conditions (pH of the effluent, temperature and the CO2 gas flow) on the neutralization performance was investigated. The effect study showed that the decreasing of the temperature and the gas flow improved the dissolution of the gas in an aqueous solution. Moreover, the optimization study showed that a gas flow of about 9mL/min bubbled during 3min at a temperature about 25°C leads to decrease the pH of 1m3 of real effluent from 12.78 to 7 at minimum time. To characterize effluent after neutralization, the variation of some pollution indicators such as: pH and the total suspended solids (TSS) was measured during the addition of carbon dioxide..
GAZZAH M1. JAOUACHI B1. SAKLY F1. This research focuses on the yarn-to-yarn and metal-to-fabric friction effects on the residual bagging behavior expressed by residual bagging height, volume and recovery of some denim fabrics as function of the yarn residual mechanical properties such as rigidity bending. To evaluate objectively yarn-to-yarn friction, represented as weft yarn rigidity and metal-to-fabric one expressed by mean frictional coefficient value, different yarn and fabric samples were investigated using two different methods, linear regression and Principal Component Analysis (PCA). To analyze objectively the effects of frictional input parameters on the residual bagging behavior, eight denim fabrics within their principal characteristics are investigated and compared. Interesting relationships between frictional inputs such as yarn-to-yarn friction, expressed by both weft yarn rigidity and the number of abrasion cycles applied, fabric frictional parameter, MIU, and the residual bagging behavior (residual bagging height, residual bagging volume and bagging recovery properties) are established. The results show, that both residual bagging height and residual bagging volume, which is determined using image analysis method, are significantly affected due to the most influential fabric parameter variations, the weft yarn densities and mean of frictional coefficients. After the applied number of fatigue cycles, the findings revealed that the weft yarn rigidity contributes on fabric bagging behavior accurately. Among the tested samples, our results show that the elastic fabrics present a high recovery ability to give low bagging height and volume values. .
MAKHLOUF C1. LADHARI N2. BRAHAM D2. ROUDESLI S1. SAKLY F2. Polyamide 6.6 microfibers were modified for the improvement of dyeing affinity using a graft copolymerization method. These microfibers were grafted with acrylic acid as monomer. The variation of the dyeing properties of modified polyamide 6.6 microfibers was investigated using cationic dye (Red Astrazon 5 BL). It revealed that the dye uptake of the modified microfibers is greater than those unmodified. The kinetic study of the cationic dye used at various percentages of grafting showed an improvement of the dye build-up rate like its exhaustion. In addition, an increase in the adsorption of the dye quantity fixed on the surface layer of microfiber made up of the grafted molecules was announced. The wash fastness is slightly improved with the grafting percentage. The modeling of the adsorption isotherms using Langmuir, Freundlich, and Jossen relations allows the determination of isotherm constants. The obtained results from this modeling study show the existence of several models corresponding to various percentages of grafting..
KABBARI M1. GHITH A1. FAYALA F2. LIOUANE N1. ABSTRACT In this research, fuzzy modeling method was used to predict the hydrophobic nature of knitted fabrics samples after a stain repellent treatment. 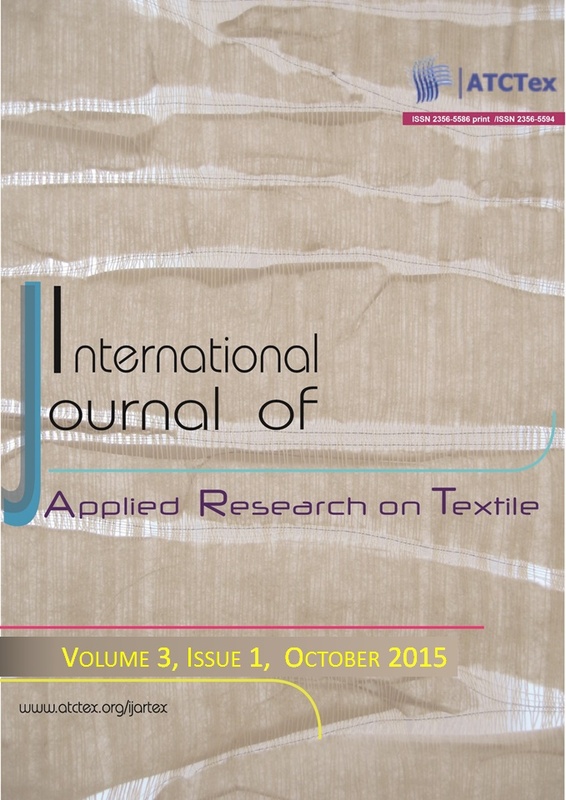 This study undertaken to maximize the values of contact angle with maintain of air permeability of fabrics. Hence, we attempt to formulate a theoretical model of predicting the behavior of the contact angle after applying a chemical treatment with a fluorocarbon resin towards the variation of the input parameters. To choose the most relevant input parameters, we used the fuzzy c-means algorithm to detect the impact of each input parameter in our experimental field of interest. Results obtained showed that the hydrophilic samples were transformed to hydrophobic one in some tests. .
DERROUICHE I1. MOUSSA A1. BEN MARZOUG I1. SAKLI F1. ROUDESLI S2. In this paper the decolorisation of cationic dyes by modified palm date fibers was investigated. The palm date is a linocellulosic fiber, thus itÃ¢â‚¬â„¢s able to adsorb and absorb an important amount of dyes. These fibers were physically modified by deposition of zeolites on their surface. The highly porous minerals are widely used as primordial materials in areas where sorptive, catalytic and rheological applications are required. In this study, in order to cheek the ability of these minerals to remove colored textiles dyes from waste water. The adsorption and absorption mechanism of cationic dyes by zeolites ZMS-5 grafted onto palm fibers was investigated. Zeolites (ZSM-5)/Cellulose composites are in fact synthesized from date palm cellulose fibers and performed zeolites powders. These natural cellulose fibers are pre-treated with NaOH are modified by deposition of zeolites. Several techniques such as diffuse reflectance infrared spectroscopy and X-ray diffraction were examinated to characterize these materials. .